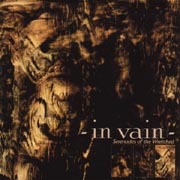 Although In Vain is a very young band, these Swedes show a maturity and promise on their debut album that very few bands exhibit even after two or three releases. The musicianship, especially that of guitarist and co-founder Patric Tindvall, is top-notch. The band's ability to create catchy melodies that stick with you long after the CD is over is a key indicator of the great potential possessed by In Vain. Beginning life as a slow-paced doom outfit founded by brothers Patric and Robert Tindvall (bass guitar), In Vain displays a very different sound on their debut album Serenades of the Wretched. While still slow- to mid-paced, the vocal style of Magnus Christiansson tends to remind me more of modern hard rock bands like Nickelback and Creed. This is just a reference point, however, as the impressive guitarwork of Patric and Johan Hasselblom creates a very mellow, morose atmosphere well suited to fans of the melancholy. Although their haunting riffs permeate the album, it's not until "Angel of Inconvenience" that the melodies grasp you fully and drag you deep within the heart of In Vain. On this track, Magnus finishes his verse around the five-minute point and before you know it Patric and Johan have lofted you over the 9-minute mark with their interwoven hooks and leads. Their jam is the perfect backdrop for a night spent in a dimly lit barroom with your favorite pint in hand, drowning the sorrows of the day. The instrumental track "Forgotten" carries on the expressive display by Patric and Johan. There's no doubt that Patric plays with a depth of feeling uncommon in today's "heavy" music. He's far from a shred king like Yngwie, but he possesses that natural, emotive kind of talent reminiscent of Stevie Ray or Clapton. No, I'm not comparing him to the greats, only saying that he has the talent and passion to rise high in the guitar world. A final highlight of the album is "Discontinued", which opens with a lush piano melody from Joakim Maule. Magnus offers up a deep, Gothic baritone on the first verse before reverting to his usual style. Although I think he wields a powerful voice, he can at times sound strained when reaching the higher ranges. This is of course just a matter of learning his limitations and where his comfort zone is, though I think it may be interesting if he were to pursue the deeper baritone he flashed on "Disconnected". Not to be overshadowed by the guitars, the rhythm section of Robert Tindvall and drummer Daniel Karlsson is tight and and does an excellent job providing a solid foundation for Patric and Johan. In fact, as a bass player myself I'm impressed with Robert's lines. All-in-all Serenades of the Wretched is a solid debut from the young In Vain and I am quite interested in hearing where their follow-up album takes them.